Heavy D! 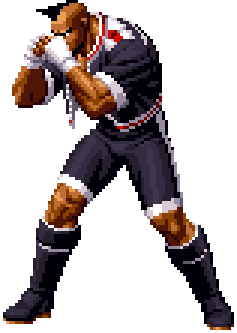 (ヘビィ・D！) is a character who first appeared in The King of Fighters '94 as the leader to the American Sports Team. Being a famous boxer, but removed from regular competition due to once having nearly killed an opponent in the ring, Heavy D! receives an invitation to The King of Fighters '94 tournament, forming a team with Lucky Glauber and Brian Battler. After the tournament ends, Heavy D! decides to tag along with Lucky and continue to look for fights all around the world, as he claims he can "live only in battles". Like the other members in his team, his invitation is stolen by other teams as a series' running gag. This page was last edited on 20 January 2009, at 20:15.